Heroes II stores its sounds as a raw WAV file, a WAV file without headers. See the Packaging Resources tutorial to learn how to extract the sound files from the original game. You can open and edit the .82M sound files using any sound editor capable of importing raw WAV data. We recommend Audacity. 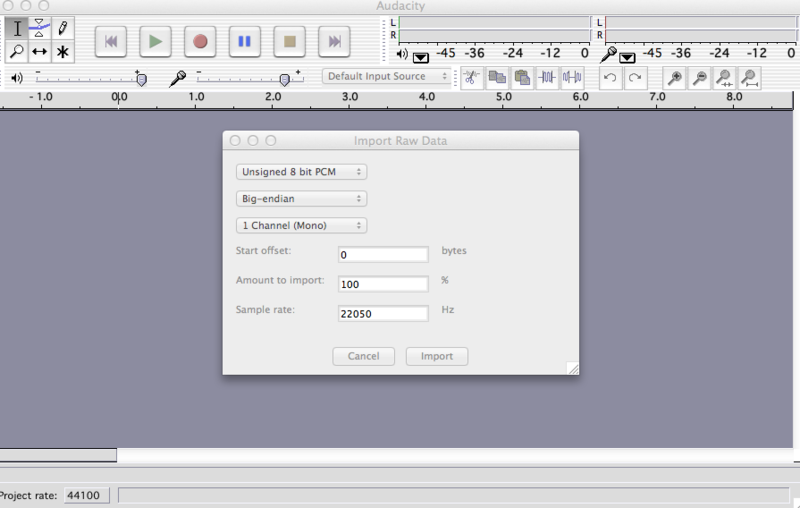 Use the "Import Raw Data" menu option and set it to import as 8-bit mono with a sampling rate of 22050. You can make sounds using any sound editor and then export them in the same format. If you are using Audacity, enter its preferences, and, under "Quality," set Sample Rate to 22050, and, under "File Format," set it to export its Uncompressed Export Format to "WAV (Microsoft 8-bit PCM)". You can then export a sound in that format, rename it to a ".82M" file, and import it into the game, though there may be a brief clicking noise at the front as the game tries to read the 44-byte header as sound. We will soon provide a utility that can remove those 44 bytes for you. While all of the original games sounds are .82M files, the game also supports a couple different formats. The "8", "2", and "M" are actually codes that tell the game how to read the file, similar to the WAV headers which it omits. Changing the "2" to a "1" or "4" (i.e. : .81M and .84M files) means that the sample rate should be 11025 or 44100. Changing the "8" to a "6" or the "M" to anything else will increase the "sample type," although we don't know what this means. For the .XMI files you can use the Awave Studio. The shareware version works only for 30 days, but you can plan ahead and download the software once you've created the needed MIDIs. The software can also play the XMI files and convert them to other file formats (but strangely I haven't found the option to convert them to MIDIs). For best results, once in the program with your MIDI, make sure there is only one track (instrument) attached to the file. If not, right click the MIDI, choose "Process...", then "Compact MIDI file size" - choose only the "Merging tracks" option. Right click the MIDI again, go to "Process..." and choose "Fix compatibility issues & improve portability". Use them all. Now you can convert the file by right clicking and saving the MIDI as XMI.